SSC JE 2019 – Staff Selection Commission (SSC) has released the number of vacancies for SSC JE 2019 at ssc.nic.in. 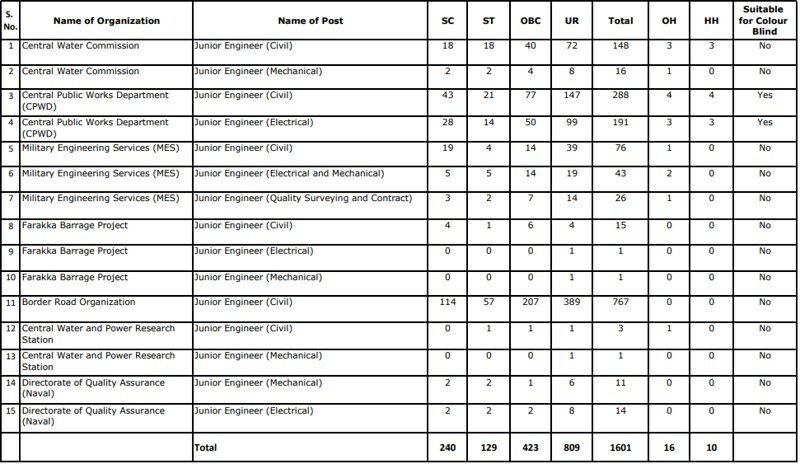 From SSC Junior Engineer recruitment 2019 total 1601 vacancy will be filled. The application process of recruitment started on February 01, 2019, the candidates can submit the form until February 25, 2019, by 05 pm. However, the fees can be submitted until February 27, 2019. The candidates of the technical background of the age group of 18 to 32 years are eligible to apply. The candidates who will enroll their names for the examination will be issued the admit card for the CBT exam 07 days prior to the exam. The paper I of SSC JE will be conducted from September 23 to 27, 2019. And paper will be held on December 29, 2019. Get here all the details of SSC JE 2019. Latest: SSC JE 2019 vacancies has been released. Scroll down to check the vacancy details. 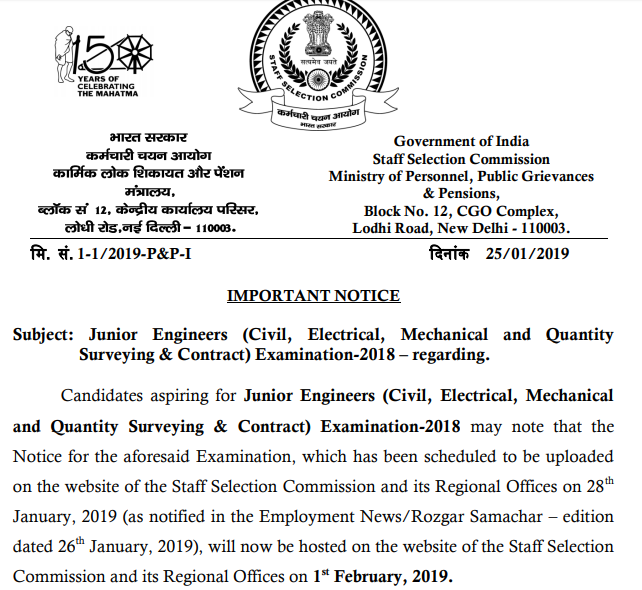 The vacancy details of SSC JE 2019 recruitment has been released. 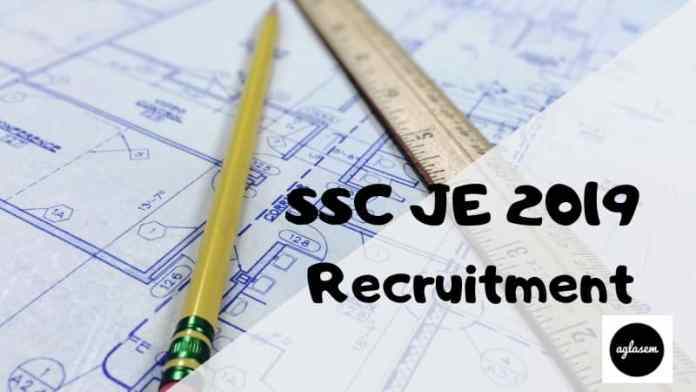 The recruitment is officially called as SSC JE 2018 but its notification is issuing in the year 2019 hence the same is abbreviated as SSC JE 2019. Staff Selection Commission has released the number of vacancies which will be filled during this recruitment process. Total 1601 vacancies are to be filled. The candidates who have applied and who are willing to apply can check the vacancy distribution from here. For general and unreserved candidates, Rs. 100/-. The SC/ST / Ex-serviceman candidates are exempted to pay the amount. The commission has provided two of modes, one is online, and second is offline. Through online, the candidates can use the credit card/ debit card/ net banking details to submit the fee online. Another method is offline, the candidates either deposit the fee in the bank with help of e-challan. The candidates are advised to fill the application form correctly in one go, as SSC will not provide any send chance to edit the application form. The candidates should keep all the essential documents handy. The candidates who meet the eligibility criteria laid down by SSC are eligible to apply. Educational Qualification: As SSC JE for Juinor Engineer so all the candidates should have the must have either degree or Diploma in Civil/ Electrical/ Mechanical. The candidates who will fill the application form in time will be issued the admit card for the recruitment examination. In SSC JE there are two papers, Paper I, paper II, on the qualification of paper I, the candidates will be allowed to appear in paper II. The admit card will be released at ssc.nic.in. The candidates will have to download the admit card only through the online. Apart from that, no other mode will be there to do the same. SSC use to upload the admit card in all regional websites, as there are 09 regions, hence at the time of issuance of hall ticket the candidates will be able to access the call letter by entering the valid credentials on the website. As we said above the candidates who are going to appear in the SSC JE, have to undergo the two stages of examination Paper I and Paper II. The Paper I will be the written examination, the paper I will be the of 02 hours. There will be three parts in the paper I, and the question will be asked from different areas as provided in the table. In SCC JE Paper II the candidates have to write a conventional written examination. The type of question will be based on the questions in different engineering stream. There will be three parts in the examination A, B, C. Part A will have the questions related to the Civil & Structural Engineering, whereas part B will have the questions from Electrical Engineering, and the part C will have the questions from Mechanical engineering. The candidates have to attempt that part which is related to his/her engineering stream. Negative Marking: No negative marking as the examination is descriptive type. After the conduction of paper I, the Staff Selection Commission will release the answer key on its official website, at ssc.nic.in. The answer key will be released for the paper I, as the paper I will be objective in nature. The answer key will be released after a few weeks of examination. Along with the answer key, the representation of the candidates will be invited to the answer key. The candidates will be able to submit the representation on payment of Rs. 100/- per question. After the improvement and corrections on the provisional answer key, the final answer key will be released. The candidates should note that they will not be allowed to raise any objection on the final answer key. After each stage of examination, the result will be announced on the Commission’s website at ssc.nic.in. The result will be in the form of a pdf containing the details of the qualified candidates. The details will have the name and roll number, engineering stream and rank in the examination. The candidates will be directly accessing the result of SSC JE 2019 when released. After paper I, the qualifier have to appear in the paper II. All the qualified candidates will be issued the admit card for paper II. At last the final merit list will be prepared. SSC released the normalization formula. From the below-given image, candidates can check the Normalization Formula Of SSC JE 2019. The selection criteria of the SCC JE 2019 is as follows. The candidates participating in recruitment will be selected on the basis of their marks in the examination. The other measures of preparing the merit list are the post preference and cut off marks decided for each category, the number of marks, any quota against the seat etc. Unreserved candidates have to obtain minimum 30% marks. OBC /EWS category candidate have to obtain minimum 25% marks. Other category candidates have to secure only 20% marks. While preparing the merit list, if any two candidates will have the same marks then their ties will be resolved by following these methods. The candidate who will have the more marks in paper I will get the preference. If again tie occurs then more marks in the paper II will be given preference. Date of birth will be taken into consideration if the above two methods fail. At last alphabetical order of name will get the preference. Through this selection procedure, the candidates will be selected for the post in Group „B‟ (Non-Gazetted). After selection, the candidates will be paid the Level- 6 of pay matrix of 7th Central Pay Commission. Initially, the monthly pay of a candidate will vary from Rs. 35400/- to Rs. 112400/-. For more information about SSC JE 2019 Exam download advertisement.